During the six years Gobions Woodland Trust has owned part of the land which made up the estate of Gobions many requests for details of its history have been received, particularly as, although so little of it now remains, its name has such strong local connections. Today when our heritage is seemingly of great importance to us it is hard to understand how a fine 18th century mansion and a garden so famed that a royal visit was made to view it could virtually vanish 150 years later. But similar lack of care of our recent past is still taking place today and the Trust hopes that this booklet will not only explain the history of Gobions Estate but also why it is important to retain the fragments which remains for the benefit not just of ourselves but for future generations. The Trust is indebted to Peter Kingsford, historian and author of several books on North Mymms in Hertfordshire; to Richard Bisgrove, Lecturer, Department of Horticulture, University of Reading, author and contributor to many books on gardening and its history: and to Linda Jonas, Hon Secretary of Gobions Woodland Trust. The Trust is also grateful to Mr. W. J. Killick for illustrations and help with the text. In a charming wood with a walk irregularly cut through the underwood the visitor came suddenly to a perfect rotunda of about the same diameter with the ring in Hyde Park … On one side is a large alcove. Opposite to the place of our entrance …is another avenue, which brought us to a large alcove situated at the end of an oblong piece of water, on each side of whose banks are fine gravel-walks, lined with rows of trees. The pond is so formed that a part of it is deep, and therefore the bottom not easily seen, but the other part is shallow … The grass at the bottom, when covered with water, hath a fine effect. From the alcove we have a view over the water to a fine large figure of Time … holding a large sun-dial … we were conducted through a most superb and elegant walk, which terminated at a summer house, built of wood, in the lattice manner, and painted green. We then turned to the left through meandering walks … to a grotto, which having passed a large arch presents itself across the walk, and through it we behold a cascade. Continuing onward, we turned to the right … to a seat where the cascade has a more distant sound. This is a very contemplative situation. From this seat a walk brought us to a good statue of Hercules … from whence, through a verdant arch, appears a beautiful canal, at the end of which is a handsome temple, whose front is supported by four pillars. In this temple are two busts of Miss Sambrookes … On one side of this canal is a Roman gladiator … Leaving the canal we ascended a straight walk, which brought us on the left to a Cleopatra, as stung with an asp … And on our right appears a very large and beautiful urn. The top of our walk terminated at a large oak, from whence there is a view over the canal … to the gladiator, and from thence through a grove to a lofty pigeon-house. Turning to the right we came to a neat and retired bowling-green, at one end of which is the urn … at the other a summer house full of orange and lemon trees. On one side of the green is a statue of Venus, and on the other one of Adonis. A last picture comes from estate agents Shuttleworth & Sons at the sale of 1838 which, allowing for some natural hyperbole, indicates that Gobions was still much as it had been for a hundred years. Messrs. Shuttleworth & Sons, No. 28, Poultry. "The mansion comprising on the ground floor dining room, drawing room, library, billiard room, gentleman’s or chapel room, sitting room & gentleman’s dressing room: on the first floor 4 principal bed chambers, 3 dressing rooms, water closet, 5 capital bedrooms, a dressing room & a water closet. The secondary apartments comprise 6 good bedrooms, store rooms, butler’s pantry, housekeeper’s room, kitchen, pantry & scullery, servants’ hall, bakehouse & larder. There are a laundry starching room, fruit chamber, washhouse, dairy, linen room, wine cellars & beer cellars capable of holding 120 barrels. Outside are the brewhouse, coal house, wood houses, knife and boot houses, water closet, coach house with granary and malt house above, stables & labourer’s cottage containing three rooms and a pantry; kitchen garden, green house & hothouse and stabling for six horses." After that there is silence. With Jeremy Sambrooke the source of wealth moved to the East. He belonged to a family having a long and close connection with the East India Company. The connection seems to have originated with Samuel Sambrooke, grandfather of Jeremy referred to hereafter as Gobions Jeremy. In 1650/1 Samuel was appointed "writer of the Company’s letters and Keeper of the Callicoe warehouse at the salary of £120 per annum", later increased to £200. His son Jeremy rose much higher. 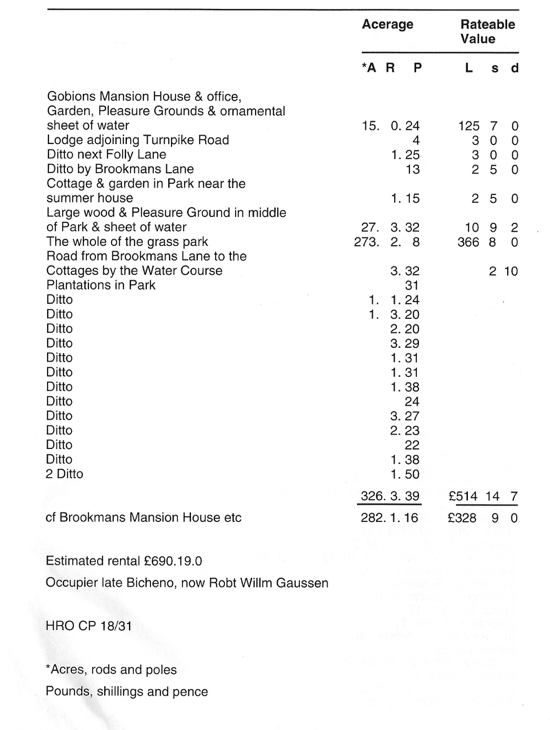 Evidently he prospered for his marriage settlement required the expenditure of £8,500 on land and property. After serving as warehouse keeper at Fort St George, Madras, he eventually became Deputy Chairman of the East India Company (1683-4), received a knighthood in 1682 and subsequently a baronetcy. A member of the Haberdashers Company, he was elected alderman for Cripplegate ward. This Sir Jeremy was a forerunner of the nabobs who came home to invest their Indian wealth in property and politics in the era of Clive of India and Warren Hastings. His grandson, son of his elder son Samuel, did follow the nabob trail and became Member of Parliament for Bedford. When Sir Jeremy died in 1705 his title and much property passed to Samuel and, upon his death, to his son Jeremy Vanaker Sambrooke. His second son, Gobions Jeremy, also inherited much property and valuables which no doubt enabled him to buy Gobions. Later, in 1740, when his nephew, Sir Jeremy Vanaker Sambrooke, died he inherited the baronetcy and "an estate of £2,000 per annum". Other property passed to him when his mother died in 1744. Imagine to yourself a vast Hill, shaded all over with a Forest of Oaks, through which have been cut an infinite Number of Alleys covered with the finest Gravel … a large Square, embellished with Orange-trees and Statues, and with a beautiful Summerhouse, whose Windows present on every Side a most delicious Prospect … a magnificent Bason, adorned with green Pyramids, orange-trees, Statues, and surrounded with wide-extending alleys; and then you see a kind of verdant Circle, all covered with the Trees of the Forest, but illumined with so much Art and Taste, as to fill the Eye with Raptures. In short, the Beauty of the Alleys, whose verdant Hedges are of a surprising Height, the pleasing Variety of the Prospects, the Richness of the Ornaments, the singular Taste that prevails through the Whole Distribution, and the Choice of the different Parts of this charming Place, form all together almost the only Garden of its kind. The wealth continued to come from the East India company when the nephew, John Freeman, sold Gobions to John Hunter who, according to one account, "by long service in trade as a free merchant in the East Indies had raised a very substantial fortune of upward of £100,00 (sic) and arrived to a seat in the East India Direction." Not only a director, as Hunter, like Sir Jeremy Sambrooke, became Deputy Chairman of the East India Company during the trial of Warren Hastings. He made himself known in Hertfordshire as Sheriff of the County and, following the nabob pattern, became Member of Parliament for Leominster. 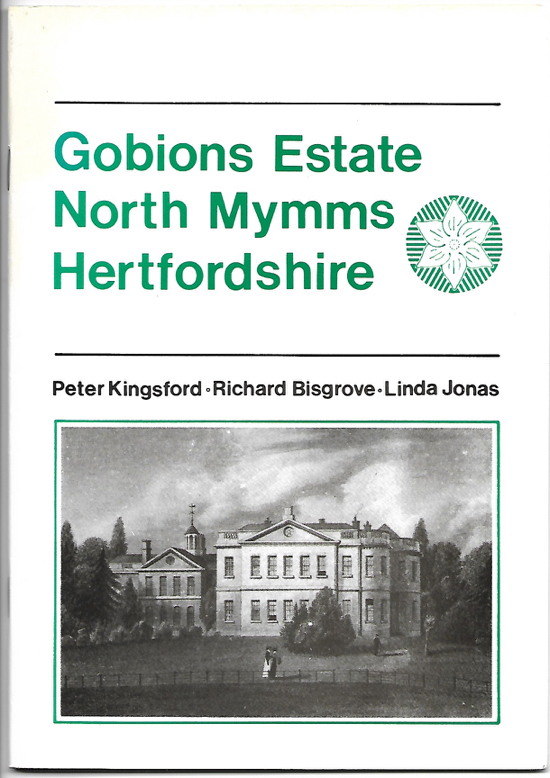 While maintaining the beauty of Gobions, he extended his property locally by buying up land on North Mymms Common which had been enclosed by the Act of 1778. He too finally rested at the parish church where a tablet commemorates him and his wife, Ann, who made her contribution with a bequest of bread for the poor of the village. Holmes, having changed his name to Hunter, seems to have remained at Gobions for about twelve years and in 1815 he sold it to a William Booth who in turn sold it two years later to Thomas Kemble. The Kembles were the last family to own Gobions as a separate estate intact with its mansion and Pleasure Grounds. With them the source of wealth moved from the East India Company. Various members of the family who were involved in the purchase and in the eventual sale of Gobions were active in foreign trade. One was a merchant of Mincing Lane in the City, a centre of the spice trade, two others were "wholesale grocers" in St John Street nearby. Much earlier another Kemble was consul in Salonica for the Levant Company, importer of spices. Something however is known about the men, with their wives and children, who had worked for the Kembles on the estate. 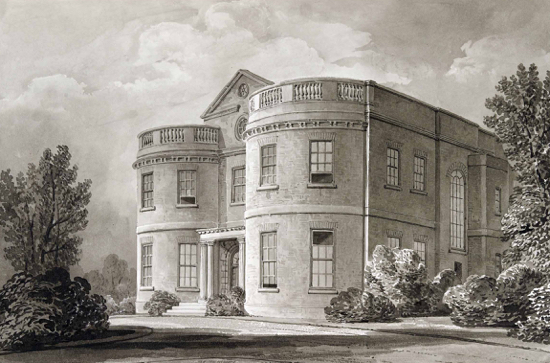 In 1841, at about the same time as the demolition of the mansion, there were the lodge keepers: John Simmons at Gobions Lodge, Richard Burgess at Gobions Upper Lodge and Philip Wilshire or Wiltshire at Leggatts Lodge across the Great North Road, whose son James had been born there several years earlier. Nearby were Thomas Mitchell in Gobions Cottage and John Clements in "Gobions Wood". Completing this little group were the two families of John Wiltshire and Charlotte Sapshead in Deep Bottom. John Simmons, agricultural labourer of thirty five and his wife, Sarah, who lived in the small four square lodge next to the Folly Arch, must have been cramped for room for there were six children between three months and nine years. A Londoner, he had recently moved from Hatfield. Ten years later they were still there and still overcrowded, for three more children had been born who, added to those still at home, made the total still six. Sarah had thus borne nine children. John had risen from labourer to gardener, presumably employed by R.W.Gaussen. This improved status, however, meant that his school fees had also risen from twopence to threepence a week. Two of the boys were now earning but they had not risen as one was an agricultural labourer and the other, at fourteen, an errand boy. At Gobions Upper Lodge, later called Moffats Lodge and still standing, Richard Burgess, a deaf and elderly labourer, and his wife Ann were also pressed for room with their four children, three of them adult. Probably Gaussen took him on also as he was still there ten years later. There was plenty of room in the Lodge by then, however, as he and Ann were alone with a grandson, the infant Samuel; he stayed there until he died at the ripe age of eight-nine. His name was perpetuated in the parish as his son John, living in Bell Bar, worked as a carter for Gaussen for thirty years. John’s wife, Anne, in the intervals between having five children, supplemented his wages as a charwoman and subsequently as a dairymaid. The name Burgess, though not perhaps the same family, continued on with Henry the pupil teacher, William the woodcutter and church beadle and Jesse the wood man who was elected to the first parish council in 1894. Thomas Mitchell, agricultural labourer of twenty five years in Gobions Cottage, lived by himself. It seems likely that his widowed mother, Elizabeth, had entered North Mymms Workhouse and, when it was closed, was one of those who were transferred to Hatfield Union Workhouse. A "well-behaved" pauper, she died there in 1838, a notable year in this history. Not far away, "Gobions Wood" was occupied by an old couple - seventy year old John Clements and sixty five year old Elizabeth. Meanwhile, in Leggatts Lodge, across the turnpike road, there were two families while Leggatts was still part of Gobions. In one were Philip Wilshire or Wiltshire, garden labourer, and Elizabeth with three small children to care for. They remained there to be employed by the Kembles. the other lodge was more crowded. William Samuel, a "male servant" - probably the coachman - and Rose had five children between eight months and ten years. Three of the children had gone ten years later but the Samuels had replaced them with two more, Alfred and Henry. Rose had Henry, her seventh child, when she was forty-five. Two other cottages stood some way off down in Deep Bottom. John Wiltshire, agricultural labourer, and Elizabeth with three young children occupied one. The other was full with five adults, elderly widow Charlotte Sapshead with two daughters and a young couple, George, agricultural labourer, and Mary English, apparently lodgers. Earlier on Charlotte’s other two children had departed. Ten years later, two other families, the Burrs and the Rands, had taken their places in Deep Bottom. Both James Burr and James Rand were tenants of Gaussen and employed by him as agricultural labourer and garden labourer respectively. Rand’s cottage was rent free, perhaps because he supported his mother as well as his wife, Eliza, and their three young children. Burr paid Gaussen £1.50 a quarter, he had only Sarah and two children. Little change seems to have occurred for a hundred years after Gaussen’s purchase except for the wild growth of vegetation smothering the Pleasure Grounds. 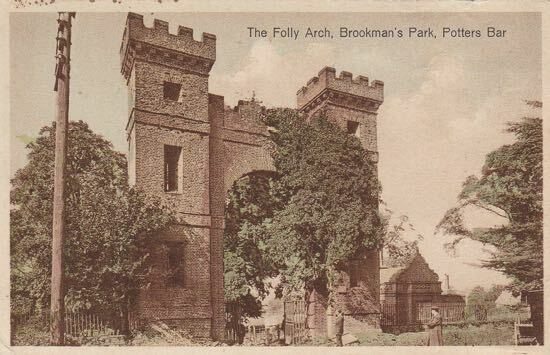 A carriage way was opened up from Folly Arch to Brookmans and, at some point, an avenue of lime trees was planted from the Arch northward to the woods. Although the farmland consisted chiefly of "rich meadow land" the sale inventory included "ploughings, half dressings, dressings, manure, seeds sown and labour done on the fallows, live and dead stock, growing crops and implements". Some farming may have been carried on but the Gaussens had numerous tenanted farms in the parish to occupy them. While the estate workers mentioned were enumerated as agricultural labourers that term covered many skills. Almost a century after the mansion was demolished there was a prospect of public money going to the rescue of the neglected estate. Hatfield Rural District Council decided in 1938 to buy part of it as a public open space, eleven acres of meadow and twenty two acres of wood land together with Folly Arch and the Lodge for £1,830. War in September 1939 put an end to the project. Gentleman’s Magazine Vol I p 874. Haynes, A View of the Present State of the Clothing Trade in England, quoted in Lipson, An Economic History of England Vol 111934. Parker, Directors of the East India Co. 1754 -1790. In 1923 the Gaussen estate, which had swallowed the old Gobioris estate nearly a century before, in its turn came to an end when the building syndicate of White, Calder, Hattrell and Burton bought what remained of the Gaussen land and the transformation from private mansion with parkland to a pleasant, residential village began. The syndicate divided the land up amongst themselves, selling off parcels for development as and when required and by the 1980’s virtually the only land left in the ownership of Calder Estates was 48 acres of pasture and the adjoining 44 acres of Gobions Wood, both part of the remains of the old Gobions "Pleasure Ground". During the period of Calder Estates’ ownership local people used Gobions Wood for recreational purposes albeit without the landowner’s consent. During the 1970’s it was obvious that the wood was neglected and when Dutch Elm Disease caused increasing blockages to the paths which were not cleared, a local resident, Michael Jonas, started to investigate the ownership of the land. In 1978, after establishing it belonged to Calder Estates and after discussions with Herts Middlesex Wildlife Trust, Mr Jonas approached their agents with a proposal to form a local trust to buy the land on behalf of the community with conservation support from the HMWT and, hopefully, also to involve the North Mymms Parish Council. However, Calder Estates were not prepared to sell and, although Mr Jonas continued to raise the proposal from time to time, it was not until 1985 that matters progressed. During the spring Calder Estates approached the North Mymms Parish Council asking them if they wished to buy Gobions Wood. In the event, the Council were advised that the wood had no value but they were prepared to pay the legal costs involved in the land transfer. This proposal was rejected by Calder Estates and in July 1985 Gobions Wood and adjoining pasture was put up for sale "with long-term development potential". 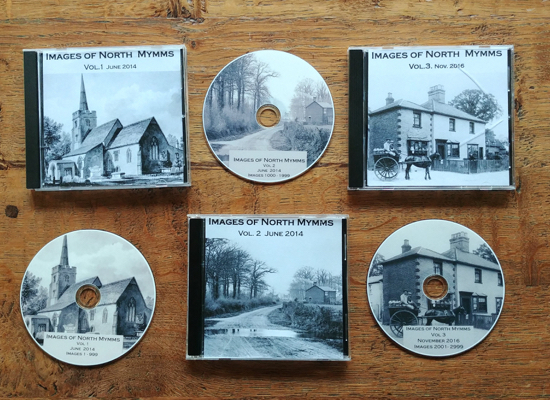 At that time Mr Jonas was the Secretary of The North Mymms Ratepayers Association and their Committee, realising the importance of Gobions Wood to the local community, called a public meeting at which residents voted to form a Trust to try and raise the money needed to buy the land. A Steering Committee was voted in to organise and spearhead the campaign. Although the initial offer of £100,000 was gazumped by a shooting syndicate to £165,500. The members of the Steering Committee worked very hard over the next six months trying to raise this money through public appeals, approaches to industry, local authorities, government and other bodies. In order to manage the land properly and obtain maximum financial benefits, the Committee formed Gobions Woodland Trust, and a second public meeting elected Fred Haynes, accountant, Robert Stephany, solicitor, and Michael Jonas, architect, as Trustees with Derek Walpole, surveyor, as the Trust’s Honorary Secretary land agent. Linda Jonas became the Trust’s Honorary Secretary. In 1993 Fred Haynes retired and Bernard Spatz, computer engineer, took over as the third trustee. Donations and covenants from local residents and industry eventually produced £50,800; the Countryside Commission gave a grant of £20,000 and, through the foresight of Michael Jonas, a small piece of land which fronted Mymms Drive was sold with planning permission for £97,000. The Trust received valuable he!p and advice from many quarters, in particular Hertfordshire County Council’s Countryside Management Team, and after a year of hard work the sale was completed in July 1986. In July 1987, the Trust bought the old pump house, settlement tanks and surrounding acre of land in Deep Bottom at the southern end of what had been Gates Lane but is now a woodland path. This small sewage works had been built in the 1920s but only served the village for a few years before the main sewer was laid. A year later the Trust took a ten year lease on the two fields adjoining the Trust’s tenant farmer’s pasture land at the west end of the wood. The Trust’s aims are to conserve and enhance the land under its management for the benefit of wildlife and the community. We are a registered charity whose Trustees are local professional people. Our volunteer workforce is drawn from the local community and we are delighted that our patron is the Marchionness of Salisbury. Since 1986 we have done a great deal of research into the history of Gobions Estate and the Bridgeman garden in particular including visiting the Bodleian Library in Oxford to look at James Gibb’s original drawings for the pigeon house. In 1988, we organised trial digs by the Hertfordshire Archaeological Trust in the area of the canal and "temple". These established the construction of the former and discovered the foundations of the latter including evidence that it had been extended to form a larger dwelling. This is borne out by an 1815 map of the estate which refers to "temple cottage". The archaeologist also confirmed the site of the bowling green which lies to the south of the canal. In 1990 we applied for County Heritage Site status and, after a comprehensive survey and report by environmental consultants, Cobham Resource Consultants, this was granted. Their report confirmed the historical importance of the site and made several recommendations for its re-interpretation some of which the Trustees are now implementing, in particular, the re-flooding of the "water works" which were such a feature of the Bridgeman design. The report also confirmed that work had been carried out in the wood during the Gaussen era as evidenced by the sequoia and other non-native evergreen trees in the area of the old driveway. 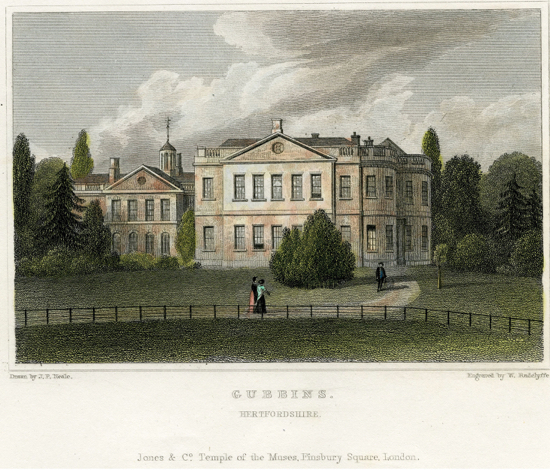 Although no written or drawn evidence of Gausseri’s personal plans for his garden has yet come to light Victorian gardening was heavily influenced by the work of John Claudius Loudon who started Gardeners Magazine in 1826. Loudon advocated the separatist use of plants with the garden being full of exotics and rarities able to bear close individual scrutiny. He always preferred a foreign plant to a native one and, in particular, recommended the use of the many new conifers being introduced during the early part of the century through the collecting work of David Douglas along the Pacific coast of North America. Many of the conifers in the wood originate from this part of the world. Our connections with Hertfordshire County Council have brought us much help and assistance over the years but none more so than when Andrew Clark of the Countryside Management Team remembered seeing a map with Gobions’ connections in the Gloucester Record Office. This chance recollection unearthed the original Bridgeman garden design drawn on a vellum estate map of c. 1735. This plan showed that the garden was more extensive than had been thought and, together with the contemporary accounts quoted in the book by Terry Friedman on James Gibb found for us by the librarian of the Royal Institute of British Architects, enabled us to locate most of the main features of the garden on the ground. The map was deposited with the Gloucester Record Office as part of the papers of the Freeman family by reason of the marriage of Captain William Freeman of Fawley Court, Buckinghamshire, with Susannah Sambrooke. The original map is 3 feet by 5 feet and shows on the left hand side the garden (as illustrated on page 18 and 19) and on the right land owned by Sambrooke in and around what is now Welham Green. It is believed that the map was part of Susannah’s marriage settlement showing the extent of the land owned by her family in Hertfordshire in which she would have had an interest. By kind permission of the Gloucester Record Office we have now produced a limited framed edition of this map which can be purchased from the Trust. We have opened up the view to the Folly Arch along the Gaussen driveway in the wood as far as our boundary with the Royal Veterinary College who now own that part of the estate south of the wood. Our future historical conservation projects include the clearing and reflooding of the canal; the establishment and marking of the exact positions of the main garden features and statues and the production of a permanent information board giving a brief history of the estate including the Bridgeman plan of the garden. The Trust shares the objectives outlined by Cobham Resource Consultants in their Management Plan to preserve and interpret the historical integrity of Gobions Wood so that knowledge and understanding of its history is not lost. Garden archaeology is as yet in its infancy but more and more we are learning that man’s "interference" with nature can tell us as much about society as his constructions and we hope that our work will mean that the silence of the last 150 years will, in fact, be only a pause in the history of Gobions. 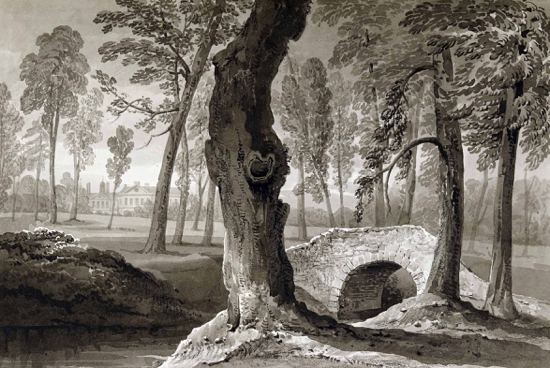 The eighteenth century English Landscape Garden, Britain’s greatest contribution to the world of art, is inextricably linked with the careers of three landscape gardeners, Charles Bridgeman, William Kent and Lancelot "Capability" Brown. Surprisingly the first of these - and in some ways the most important - remains little known and little understood despite the survival of many of his plans. Charles Bridgeman was born c.1690. His father was a gardener and may have worked for the Earl of Oxford at Wimpole in Cambridgeshire, but nothing else is known of the younger Bridgeman’s personal life until his marriage to Sarah Mist in 1717. The first evidence of his work is a signed plan of Blenheim dated 1709 and this early association with Blenheim is highly significant in two respects. Firstly it establishes Bridgemans link with a distinguished series of gardeners extending in direct line back to the creator of Louis XIV’s great formal gardens, Andre le Notre. Le Notre was a pupil of Claude Mollet at the Tuileries; John Rose, royal gardener at St James’ Park, was a pupil of Le Notre at Versaillies before working at St James’s where he succeeded three of Mollet’s sons in 1666. George London was apprenticed to Rose at St James’s and, on Rose’s death in 1677, became deputy to William Bentinck, 1st Earl of Portland, in charge of the royal gardens for William and Mary. In 1681, London and three other eminent head gardeners established the Brompton Park Nursery and in 1687, when the other three partners had died or retired, George London took Henry Wise into partnership. Under London and Wise, Brompton Park became the foremost nursery in the land, and the two men between them played a major part in the construction of most of the great formal gardens of the period. On the death of William III in 1702 Bentinck was dismissed and with him, George London, but as Queen Anne then appointed Henry Wise as master gardener, Brompton retained its pre-eminence. When Anne gave Woodstock Manor to the Duke of Marlborough in gratitude for his victory against the French at Blenheim, it was inevitable that Brompton Park would be involved in stocking the gardens. Charles Bridgeman’s apprenticeship to Henry Wise at Blenheim thus ensured that his career would be founded on a long tradition of horticultural excellence, and that career culminated with his own appointment as royal gardener to George II and Queen Caroline. The second connection concerns the architect at Blenheim, Sir John Vanbrugh. Vanbrugh, a soldier and dramatist turned architect, had many ideas far in advance of his contemporaries and had already experimented with the dramatic potential of buildings in the landscape at Castle Howard in Yorkshire. At Blenheim he advised the Duchess of Marlborough to keep old Woodstock Manor as a picturesque feature of the new landscape, and urged her to call in a landscape painter to exploit the full pictorial qualities of the park. Vanbrugh’s relationship with the duchess was rarely anything but stormy so it is hardly surprising that she ignored the advice: Woodstock Manor was pulled down to provide building materials for the bridge and the park was laid out on traditional strictly regular lines. Blenheim, though, marks the beginning of a long association between Vanbrugh and Bridgeman, an association which must have influenced Bridgeman’s artistic sensibilities. The extent of Bridgeman’s involvement at Blenheim is uncertain. In 1709, the date of his first known plan, he was about twenty, much too young to have been entrusted with the design of so important a garden. Wise records having to employ "one man constantly for making surveys and draughts of Her Majesty’s palaces, gardens…" so it seems probable that Bridgeman arrived at Blenheim under Henry Wise’s wing, possibly following an apprenticeship at Brompton Park, as surveyor/draughtsman then, finding a like mind in Vanbrugh, developed an informal association in which the older man designed the buildings while Bridgeman laid out the general lines of the gardens. In 1713 Bridgeman was working at Stowe, several years before Vanbrugh was called in, and when the garden was greatly enlarged in 1720, it was Bridgeman who sited the Rotunda at a pivotal point in the garden, pulling the scattered fragments of the older garden into a single composition. The angle of his bird’s eye view of Stowe, c. 1720, seems deliberately chosen to reduce the dominance of the central axis and to emphasis instead the complex network of walks and vistas that laced the garden together, making Stowe the talking point of Europe. In 1718 Vanbrugh prepared plans for a house almost on the scale of Blenheim for George Dodington (a cousin of Viscount Cobham at Stowe) at Eastbury, Dorset. Bridgeman provided plans for the gardens, marshalling trees with all the forcefulness of a military parade. Dodington died in that same year and work was not recommenced by his son, George Bubb Dodington, until 1724. Charles Bridgemans work at Stowe and Rousham, especially, exemplify his great contribution to landscape gardening: the freeing of the English garden from the rigid geometry inherited from the French and the Dutch. Prolonged wars with France fostered a distaste for the autocracy symbolised in Le Notres vast parterres, dismissed by Lord Shaftesbury as "the formal mockery of princely gardens". Ironically those same wars might be seen as providing the means for liberation. Lord Cobham was one of Marlborough’s generals at Blenheim and, on retirement to Stowe, adapted the military "fosse" or ditch to garden use allowing the eye to roam beyond the garden to the wider landscape. Horace Walpole credits Bridgeman with this crucial development: "But the capital stroke, the leading step to all that has followed, was (I believe the first thought was Bridgeman’s) the destruction of walls for boundaries, and the invention of fosses - an attempt then deemed so astonishing that the common people called them Hal Ha’s! to express their surprise at finding a sudden and unperceived check to their walk". At Stowe the ha-ha spanned the broad main vista beyond the octagonal basin, allowing the eye to sweep without interruption down from the house to the water and up to the Corinthian Arch on the skyline. At Rousham the garden proper was separated from the paddock right next to the house by a ha-ha so that grazing cattle appeared to enter the very heart of the garden. When Walpole went on to nominate Bridgeman’s successor, William Kent, as the man who "leapt the fence, and found all nature was a garden" it was not forgotten that Bridgeman first lowered the fence into a fosse, making it easier for Kent’s portly figure to make that historic leap. Walpole commented further on the increasing freedom of Bridgeman’s designs "…though he still adhered much to strait walks with high clipped hedges, they were his only great lines; the rest he diversified by wildernesses and with loose groves of oak, though still within surrounding hedges … in the royal garden at Richmond (he) dared to introduce cultivated fields, and even morsels of a forest appearance". And at Gubbins in Hertfordshire he observed "many detached thoughts, that strongly indicate the dawn of modern taste". Other commissions followed in rapid succession. Claremont in Surrey, sold to Thomas Pelham-Holles, later 1st Duke of Newcastle, by Vanburgh included a vast amphitheatre overlooking a round pound. Boughton, Northamptonshire, for John, second Duke of Montagu (nicknamed "John the Planter), the son-in-law of Sarah, Duchess of Marlborough, was noted for its canals and for its miles of avenue. At Wimpole, Cambridgeshire, Bridgeman worked for Edward Harley, second Earl of Oxford, whose marriage to the Duke of Newcastle’s daughter, Henrietta Cavendish Holles in 1713, allied him to one of the richest families in the land. Harley spent much of his (and his wife’s) fortune on his garden and his library (to which Bridgeman was noted as being a frequent visitor), but he also developed the prestigious Marylebone estate which came to him on his marriage. Charles Bridgeman prepared designs for Cavendish Square, the heart of the estate, and soon after planned the layout of St James’s Square, the most aristocratic square in London. He also contemplated moving to Marylebone, taking a lease on a house designed by James Gibb in 1725. However, in 1726 Henry Wise’s partner in the royal gardens died and Bridgeman was appointed in his place, thereby acquiring official residences at Hampton Court and Kensington in addition to his own house in Westminster. When Wise himself died in 1728, Charles Bridgeman became sole royal garden to George II and Queen Caroline. This royal appointment could hardly have been unexpected: Bridgeman had already worked for the then Prince of Wales and Princess Caroline at Marble Hill as well as for the Prime Minister, Sir Robert Walpole. Queen Caroline, in particular, took a great interest in gardening and Bridgeman was frequently engaged in modernising the royal parks and gardens, introducing the fields and morsels of forest at Richmond as well as attending to the more mundane duties prescribed for his post: digging and cropping and vegetable gardens, tying up fruit trees, rolling the walks, weeding and sweeping. He was even required to procure the dung for the gardens and to provide his own equipment - including a large trolley for the moving of orange trees. Bridgemans appointment as royal gardener in 1726 was followed by his election to St Luke’s Club of Artists, a small and highly respected club for men "of the highest Character in Art & Gentlemen Lovers of Art". His election signified his true place in landscape gardening, not as a mere practitioner with clients but as a member of a close circle of virtuosi, men of outstanding discernment and collectors of art. Bridgeman came as often to comment on, improve or correct the garden plans development by his patrons as to submit his own plans, and he came as a member of the extended household, enjoying the use of the library at Wimpole for example and joining the social and intellectual activities of the assembled company of patrons and other artists. Walpole aptly summarises the essence of Bridgeman’s mature designs, a backbone of bold, straight vistas skillfully exploiting the lie of the land and connecting the main features of the garden - canals, bowling greens, amphitheatres, temple - but interlaced with meandering walks through a wilderness of forest groves and extending into the surrounding countryside by use of the ha ha to conceal the boundaries of the garden. In many, estates it was Bridgeman who provided the structure to the landscapes subsequently modified by Kent and Brown. 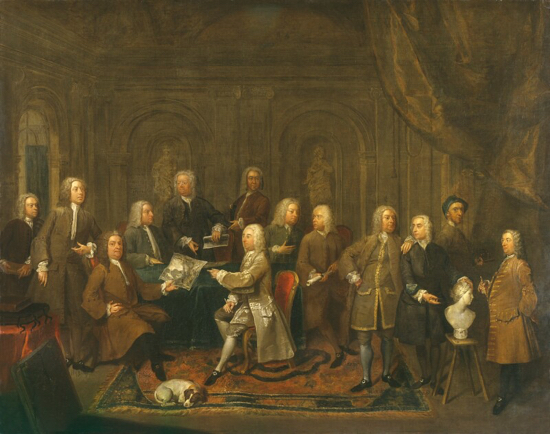 Image of 'A Conversation of Virtuosis...at the Kings Arms' by Gawen Hamilton 1735. Bridgeman died of dropsy in 1738 aged about fifty. Sadly his ingenuity at organising the landscape and uniting often disparate architectural elements into a coherent whole seems not to have extended to his domestic affairs. His life as a member of St Luke’s and as an active participant in the social and cultural company of artists and aristocratic connoiseurs was expensive. Sarah Bridgeman found herself impoverished and it is ironic that much of what we now know of Bridgeman’s methods of working comes from details in his widow’s innumerable law-suits as she struggled strenuously, until her own death five years later, to obtain the money supposedly owed to her husband. Perhaps the last comment on Charles Bridgeman should go to the other Sarah, Duchess of Marlborough, the subject of one of Mrs. Bridgemans most heated suits. After her disagreements with Vanburgh and the dismissal of a whole string of other artists the Duchess engaged Bridgeman to develop and maintain the garden in 1728 and he was actively involved there until his death. The Duchess, never one to mince her words, described Bridgeman as a man who was "honest and meant to do justly in everything". 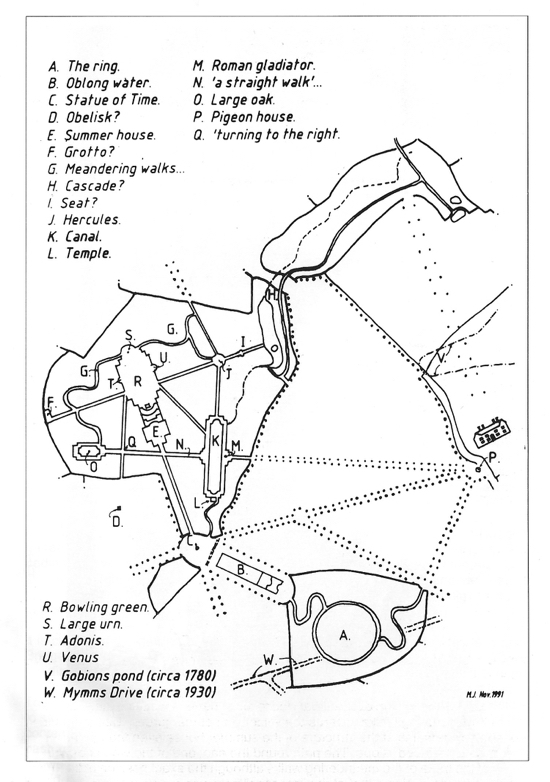 Walpole’s summary of Bridgeman’s mature designs as "a backbone of bold, straight vistas skillfully exploiting the lie of the land and connecting the main features of the garden - canals, bowling greens, amphitheatres, temples - but interlaced with meandering walks through a wilderness of forest roves and extending into the surrounding countryside by use of the ha-ha to conceal the boundaries of the garden" was well illustrated by his design for Gubbins as can be seen from the plan of the garden overlaid on the estate map of c.1735. By studying the 1774 description of the garden quoted earlier it is possible to identify most of the features mentioned and a key plan showing these more clearly has been drawn. Today, owing to the ravages of time and R. W. Gaussen, very little of the garden remains and the "morsels of forest" have virtually taken over. However, if we follow the route of the 1774 walk it is possible to find some of the main features and to have a faint echo of the "surprising greatness of Gubbins" noted by George Bickham in 1748. Gubbins mansion stood north of Gobions Pond where the back gardens of The Grove meet the wooded area known as Gobions Garden. It was approached by a gravel driveway running east/west from the Great North Road, then known as the Kings Highway. From the house the land drops down to a small valley with the Raybrook stream running through before rising again to Swanley Bar. The 1718 field map refers to Lowins Spring field to the east of the house, evidence of the underground springs in water. 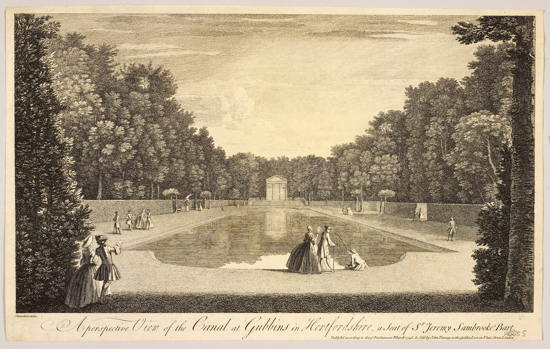 Bridgemans plan uses straight and meandering walks, formal and informal pieces of water, statues and buildings, thickly planted trees and open spaces all to give a variety of experience from the elegant bowling green with its pyramid-shaped trees, exotic orange and lemon trees and statues to the mysterious grotto and "wild" cascade. From the house the walk passed by a large, seven sided stone pigeon house designed by architect James Gibb possibly in 1732, who worked on extensions to the house and on several other commissions with Bridgeman. A straight avenue then took the visitor to a rotunda of trees reminiscent of Stowe with a gravel walk round to the first large piece of water. Some of the fine mature oaks in the gardens of houses in Mymms Drive must have been part of this rotunda and the "oblong piece of water" can still be seen from the path to the wood from Mymms Drive although now it is very overgrown with trees and water plants. The pigeon house was sold off by Gaussen, as was the "fine large figure of Time...holding a sun-dial" which was viewed over the pond. After crossing the stream a formal walk led to the summer house and then turned left through meandering walks towards the wilder end of the garden. Being of timber, nothing now remains of the structure of the summer house even though the site is visible as a "terraced’ slope. The path round the east end of the wood does follow much of the route of the meandering walks although the exact position of the grotto is no longer clear. Nor is that of the "cascade" however our current assessment is that this was at the west end of the path planted with redwoods by Gaussen and that the puddingstone-faced bridges formed part of this feature. There is also a circular depression in the area which could have been the site of a formal curved stone seat, the ‘contemplative situation" referred to by "The Ambulator". From the seat, the path led to the statue of Hercules which formed a focal point looking down straight avenues to the canal, the bowling green and back towards the cascade and its site can be seen a few yards over the Victorian brick bridge towards the Folly Arch. The visitor now walked alongside the canal which is still clearly visible with, as at Rousham, its temple at the east end. The remains of the temple foundations were partially excavated in 1988 by the Hertfordshire Archaeological Trust but until a full dig can be carried out they have been left hidden by undergrowth. By their size, the fine horse chestnut trees at each end of the canal could have been planted by Bridgeman. It was the opinion of the ecologists who surveyed the wood for the Trust that the hornbeam in particular in the area of the garden were not part of an existing wood but were planted in pasture and they do grow in a very even pattern echoing the "military precision" of the planting at Eastbury. Leaving the canal the route passed the statue of "Cleopatra as stung with an asp", the loss of which can only be regretted as with all the statues mentioned, on its way to the large oak where the walkers stopped for a view across the canal back up to the pigeon house. This oak no longer stands possibly because as elsewhere in the country most of the oaks in the wood were cut down during the 1914-18 war for trench props etc. The walk concluded by visiting the bowling green, the site of which can still be clearly seen as a flat area with raised banks on its southern boundary. 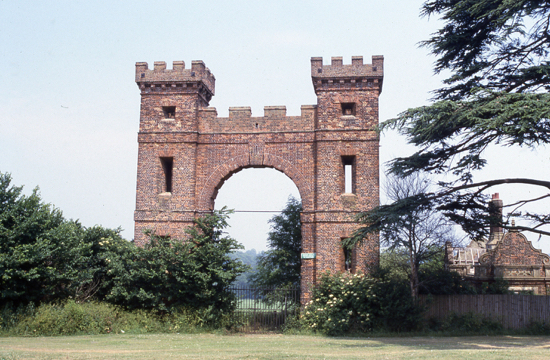 The Folly Arch, which Gobions Jeremy had erected in 1740, is attributed to James Gibb for its design but does not appear to be part of the original Bridgeman plan. It was apparently erected to commemorate the estate’s connection with Queen Elizabeth 1 (the estate being given to her in 1550 by Edward VI but returned to the More family by Mary Tudor in 1553). It was built as a "triumphal arch" and was not intended as a gateway, however when he combined the two estates Robert Gaussen made a new driveway up to Brookmans along one of Bridgeman’s tree lined avenues with the arch as its main entrance. In order to allow carriages to have a straight run through the wood instead of using the old causeway which kinked round to the left he re-routed the stream and built a new brick bridge crossing it at right-angles. The pedimented walls to this bridge have now but a fine view of the Arch can still be had from this position. The avenue lime trees was felled and the stumps blown up during the 1939-45 war as part of the "Dig for Victory" campaign to make this country self-sufficient in food. It is clear that the garden at Gubbins incorporated most of the features for which Bridgeman became known with the apparent notable exception of the ha-ha. There are ditches and banks round the perimeter of Gobions Wood but whether these are the remains of mediaeval hedge and ditch boundaries or of ha-ha’s is difficult to say. There appear to be banks marked on sections of the plan but again it is not possible to say for certain what these are and no mention is made of ha-ha’s in either of the contemporary descriptions of the garden. All we can conclude is that the surrounding pasture would most probably have been grazed, the animals would not have been allowed to wander amongst orange trees and gravel paths and Gobions Jeremy would have wanted an uninterrupted view from the house of "one of the most remarkable Curiosities in England". 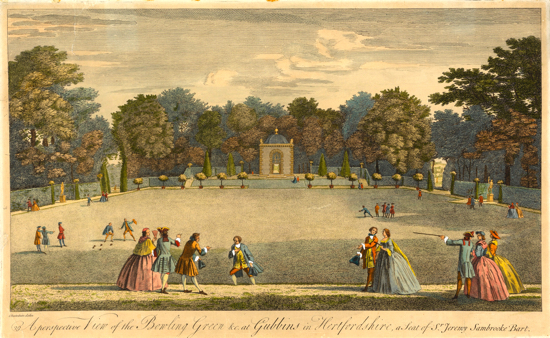 Etching of The Bowling Green at Gubbins 1748. 1693 Sir Edward des Bouverie, a London merchant. 1697 Sir Robert Beachcroft, woollen merchant. Although the 1735 map shows that Gobions Jeremy owned land in and around Welham Green his and Gobions’ connection with that village have not survived in any place names today. However, two roads in Welham Green are named after other families with connections with the Estate, firstly Knolles Crescent recalls Margaret Knolles who rented Gubbins for twenty-one years from 1586. She was a litigious lady who was involved in several lawsuits against local landowners without a great deal of success. Secondly, Coningsby Close which is named after the Coningsby family. The Barnet and District Record Society Half-Yearly Bulletin, October 1952, records that after Sir Thomas More was executed all his lands became forfeit to the Crown. However, Gubbins had been left to his step-mother, Alice, for her lifetime and it was not taken by the Crown until approximately 1545. In 1546, the Crown leased the land to Sir John Mason but another local landowner, Elizabeth Coningsby, alleged that eight of the fields included in the estate, "Mylkesoppes", Langborowes", "Annot Fryers’, "Butters’, "Shilbornes’, "Baldwyns Croft", "Cley Croft’, and Redinges" had been held by the More family by copy of the court roll of the manor of North Mymms of which she was lord. If this was correct, as the land in question was not freehold it should not have been taken by the Crown after the death of Alice More. The outcome of the case is not known but it is most likely that the Crown was successful ("The King can do no wrong") and SirJohn Mason remained the tenant for several years at an annual rent of £50.9s.8d. Cover image. View of Gobions from south west across pond. This pamphlet was designed by Michael Jonas and first published in 1993 by the Gobions Woodland Trust.